Table 1. Composition of high- and low-fat diets as given in Cheverud et. al in Diabetes, volume 53, December 2004, page 3329.
a. At 3-wk of age, while the mice are being weaned, the weanlings are randomly assigned to low- or high-fat diet. b. While maintained in their respective dietary regime, the mice are also weighed weekly until 20-wk of age. Parental strains: Large (LG/J) white mouse on the left and Small (SM/J) agouti mouse on the right (photo from The Cheverud Lab). a. At 10- and 20-wk of age, the mice are fasted for 4 hrs before blood is drawn to measure serum glucose. b. After obtaining fasting glucose levels, the mice are then given intraperitoneal injection of 0.01 mL of 10% glucose solution per gram body weight. c. Blood samples are taken at 15, 30, 60, and 120 min for glucose tolerance test. d. A blood glucose meter is used to measure glucose levels in a drop of blood sample according manufacturer's instruction. a. 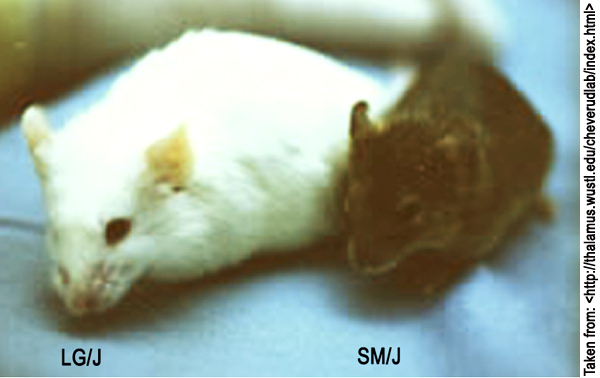 Between 20-30-wk of age, the mice are again fasted for 4 hrs and prepared for necropsy. b. For restraint, mice are given i.p. injection of sodium pentobarbital before obtaining blood via cardiac puncture, which is a terminal procedure. c. Tail lengths are measured as an added indicator of growth (skeletal). d. The thoracic and abdominal cavities are opened for the dissection and subsequent weighing of the heart, spleen, liver, and kidneys. Note: To facilitate the dissection of the gonadal fat pads, the entire uterus and ovaries or testes can be removed from their attachments to the pelvic floor. Likewise, the entire intestinal loop can also be removed from its attachment to the root of the mesentery, and then straightened and unwound for the dissection of the mesenteric fat pad. In contrast, both the inguinal and the perirenal fat pads may be dissected in situ. f. Collected blood is centrifuged for the separation of plasma, and its storage- to be analyzed at a later date for blood lipids (free fatty acid, cholesterol, HDL, and triglycerides) and hormones (insulin and leptin). Weekly body weight (from 1-wk to 20-wk of age), 10 and 20-wk serum glucose plus glucose tolerance and glucose clearance (AUC), 20-30wk plasma lipid (cholesterol, HDL, triglycerides, and free fatty acid) levels, and hormone (insulin and leptin) levels, followed by necropsy body weight, organ (liver, spleen, kidney, heart) weights, fat pads (gonadal, inguinal, mesenteric, and perirenal) weights. MPD calculated measurements: fat pad weight as % of body weight. AUC: Area under the curve (graph of blood glucose levels following i.p. injection of 10% glucose challenge, typically obtained at 15, 30, 60, and 120 min), which is indicative of a mouse's ability to clear glucose. Mice with low AUC reflect a greater efficiency in clearing glucose, as well as healthier insulin mobilization and sensitivity. pre-weaning = from birth to three weeks of age. post-weaning = from 3 wks of age to 10 wks of age. adult = 10 wks old and beyond.